You bought a much-needed new home office desk - exciting! You took all of the parts out of the box and you just finished the daunting task of putting it all together. Your desk is ready, but you need to move it into the position you want. It takes 3 of you to carefully move this mammoth, and you are just about to the right spot when - screech - the desk collides with your end table, and both beautiful pieces are now marked with long, deep scratches on the sides. Oops! You should have had this HD Universal Utility Protection Blankets 72" x 45" Inch to fully cover the desk as you moved it. Scuffs, scratches, and deformations to your valuable items can be avoided by protecting them with these moving blankets. Whether moving or storing housewares, furniture, or other valuables, protect your items from accumulating dust, dirt, debris, moisture, or other damaging residue with these utility protection blankets. They have so many uses and are great supplies to have while camping or hunting, can be used for picnics, as a dog blanket, in the workshop, under vehicles, and much more. 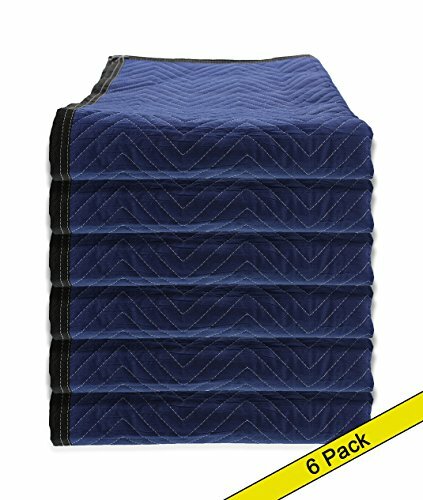 Unlike cheap paper moving pads, these HD Universal Utility Protection Blankets do not tear during transit and can be used time and time again. At 1.5 pounds each, or 18 pounds per 12 blankets, these are super lightweight yet extremely durable protection blankets. They are constructed of a strong fabric and have 3-inch cloth binding on all 4 sides with 4 finished corners. These blankets are easy to unfold, place over your valuables, and refold when not in use. They make every project easier when protecting or cleaning up and by doing it in a comfortable and smart way.